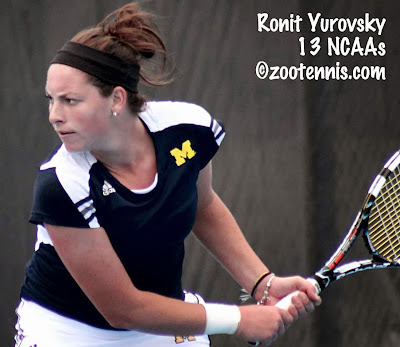 The NCAA has announced the finalists for its Division I Tennis Championships for the years 2014-2018. The University of Georgia will be hosting the event in 2014, so for the four years after that, there are eight venues still in the running for the combined men's and women's event. For all the talk of format changes--and I wouldn't presume that the team and individual championships will necessarily be scheduled back-to-back, as they are now--this seems to guarantee the men's and women's events will continue to be combined, which suits me just fine. I don't like to have to choose between tournaments, as I have to do for the All-American and (usually) the Team Indoor. Five venues who have hosted previously are on the list: Georgia, Texas A&M, Stanford, Tulsa and Illinois. Three schools who have not hosted also made the finalist cut: Baylor, Vanderbilt and Wake Forest. Whether all these schools will still be willing to host if the NCAA should move to a Final Four rather than Sweet 16 finals site remains to be seen. The NCAAs complete list for all sports finalists can be found here. The acceptances for December's Grade A Orange Bowl were released earlier this week, with world No. 1 Alexander Zverev of Germany and Karen Khachanov of Russia leading the boys entries. Zverev, who has reached the quarterfinals of this week's Pensacola Futures after making the semifinals last week in Birmingham, may be trying to solidfy his hold on the No. 1 position, which he recently claimed from Croatia's Borna Coric, who is not entered in the Orange Bowl. 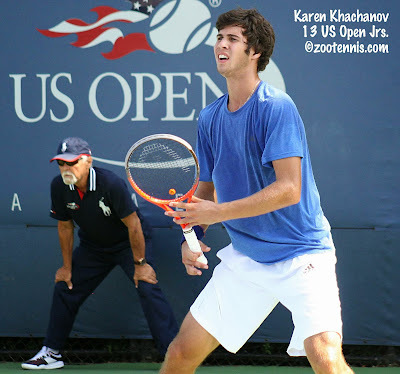 European junior champion Khachanov reached the quarterfinals of an ATP tournament earlier this month, and has three wins at that level since the US Open Junior Championships, so it's a bit of a surprise that he would enter a junior tournament. Wimbledon boys champion and world No. 3 Gianluigi Quinzi of Italy is entered as is 2012 finalist Elias Ymer of Sweden. Kwiatkowski, a freshman at Virginia, has not played this summer and fall due to wrist surgery, but he hopes to be ready to compete by next month to close out his junior career in Florida. He was a semifinalist last year at the Orange Bowl. The highest ranked girl to enter is No. 5 Varvara Flink of Russia, followed by Ivana Jorovic of Serbia, No. 10, and Tornado Alicia Black, No. 11. In addition to Black, the US girls in the main draw are: Christina Makarova(21), Johnnise Renaud(43), Katrine Steffensen(46), Dasha Ivanova(62), Michaela Gordon(72), Usue Arconada(87), Rianna Valdes(89), Kaitlyn McCarthy(101) and Madison Bourguignon(103). The complete acceptance list can be found at the ITF junior website. Louisa Chirico, the US girl with the highest ITF ranking (7), is not on the acceptance list, which is disappointing if only because she is so fond of clay. Chirico is having an excellent week on the hard courts at the $50,000 New Braunfels Texas Pro Circuit tournament, picking up her first WTA Top 100 win yesterday and following that up with another routine victory today. Chirico beat top seed Mariana Duque-Marino of Colombia, ranked No. 90, 6-1, 6-3 in the first round, and defeated veteran Petra Rampre of Slovenia 6-1, 6-2 today. Next up for the 17-year-old New Yorker is Bulgarian Elitsa Kostova, whom she beat earlier this year in a $25,000 tournament by the daunting score of 6-7(7), 7-6(3), 7-5. The other quarterfinal matches feature three former Pac-12 players, with USC's Maria Sanchez facing Stanford's Nicole Gibbs. USC's Danielle Lao, who qualified, meets Madison Brengle, while former UNC star Sanaz Marand plays Anna Tatishvili of Georgia. The Intercollegiate Tennis Association today announced the remaining competitors for the USTA/ITA Indoor Intercollegiate Championships, which begin next Thursday at the USTA Billie Jean King Tennis Center in New York. In addition to players who won their regional championships and those who earned their spots in the draw by their performance in the All-American Championships earlier this month, others receive entry via wild cards and at-large bids. The USTA has one men's wild card, which went to Marcos Giron of UCLA. Columbia's host wild card was given to Max Schnur. The ITA gets two men's wild cards and those went to Raymond Sarmiento of Southern Cal and Andrew Harris of Oklahoma. Oklahoma now has four players in the draw, the most of any school. Last year's men's singles champion, Jarmere Jenkins of Virginia, was a wild card. The men's doubles draw has two at-large bids, which went to Virginia Tech's Andreas Bjerrehus and Amerigo Contini and Texas A&M's Junior Ore and Jackson Withrow. Florida's Gordon Watson and Elliott Orkin received the USTA wild card and Ashok Narayana and Schnur received the host wild card. The women's entries have slightly different rules. They have ten at-large bids, with six of them going to regional championship finalists and the remaining four selected based on fall results. There is an extra at-large place available this year, with Cristina Stancu of Texas A&M qualifying as both an All-American semifinals and a regional champion. Northwest regional champion Kristie Ahn declined her invitation, with finalist Jenny Jullien of St. Mary's taking her place. The USTA has two wild cards on the women's side, and they went to Sabrina Santamaria of Southern Cal and Hayley Carter of North Carolina. 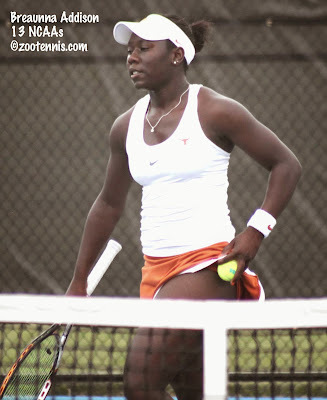 The ITA's wild card was given to Breaunna Addison of Texas. Columbia's Bianca Sanon received the host wild card. Santamaria, who has been struggling with an injury this fall, also received the USTA wild card into doubles, which is hardly surprising, as she and Kaitlyn Christian are two-time defending champions. The host wild card went to Sanon and Kanika Vaidya. Defending singles champions Robin Anderson of UCLA qualified for doubles, winning the All-American with Jennifer Brady, but she will not be playing, with Brady and Catherine Harrison, the regional champions, competing instead. That accounts for one of the extra at-large bids, the other is the result of the Northwest regional champions Taylor Davidson and Ellen Tsay declining their invitation. Since Ahn and Carol Zhao were the finalists, and apparently bowed out too, an extra at-large team was added. For the complete list of all the competitors and how they received entry, see the ITA website. The third and final fall event that brings USTA juniors and college players together for competition begins Friday in Portland, Oregon. Although I will not be attending this year, after covering the inaugural tournament last year, I will be closely following the results at the USTA Collegiate Invitational presented by Adidas. The first five teams listed all participated last year, the final three are taking the place of Georgia, Portland State and Washington. Unlike the USTA Clay Court Invitational, this format includes round robin play in eight groups, with the winners competing in a tiebreaker shootout to determine the overall champion, just as the Napa event for boys is now structured. Junior Brooke Austin won the shootout last year over Georgia's Maho Kowase. There is also a doubles tournament, which is a standard 16-team draw, concluding on Saturday. Last year, UCLA's Kyle McPhillips and Skylar Morton won the doubles title. The acceptances for the 12s, 14s, and 16s age divisions for the Eddie Herr International have been posted at the tournament website. Access them by clicking the blue banner on the home page. (The entries for the ITF Grade 1 do not close until next Tuesday). Although the main draws are the same size as they were last year--64--the qualifying draws have been expanded, to 96. Qualifying begins on Thanksgiving Day, Thursday, November 28. The first round of the $75,000 Charlottesville Challenger will be completed later this evening, but there won't be a bigger upset than the one that occured this afternoon, with former Alabama star Saketh Myneni of India defeating top seed Tim Smyczek 6-4, 4-6, 7-5. Myneni, currently ranked 313 to Smyczek's 83, has four Futures titles and a win over Donald Young this year, but this victory has to be one of the biggest of his career. Myneni never had a huge impact in collegiate majors, but if you ever saw the racquet-head speed he could generate, you probably wouldn't be surprised by the success he's having now. Chase Buchanan picked up a 5-7, 7-6(2), 7-6(3) victory over Austin Krajicek that was every bit as close as the score would indicate. Buchanan failed to covert on set points at 4-5 in the first, then fell behind 0-2, 0-30 in the second, but managed to turn the match in his direction at that point. 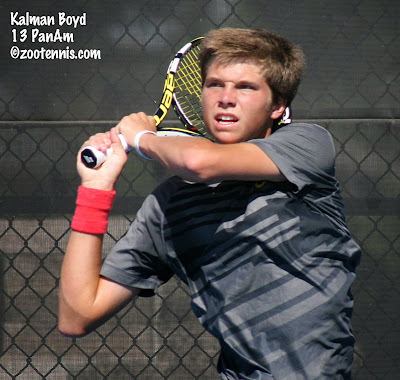 Buchanan and Krajicek have much in common, just a year apart in age, both Kalamazoo 18s champions (Krajicek in 2008, Buchanan in 2009), and both NCAA doubles champions (Krajicek in 2011, Buchanan in 2012). Buchanan now leads their pro head-to-head 3-1, but on the basis of today's match, there should be many more close, exciting matches between the two. Last night, wild card Mitchell Frank reached the second round with a 6-4, 3-6, 6-4 win over South African Rik De Voest. Today's winners included No. 7 seed Rhyne Williams, Tennys Sandgren and 2012 ITF World Junior champion Filip Peliwo of Canada, who beat Bjorn Fratangelo 6-2, 6-2. Qualifier Kevin King, the former Georgia Tech star, continued his excellent play of late, defeating former UNC standout Jose Hernandez of the Dominican Republic 6-3, 6-1. Seventeen-year-old wild card Noah Rubin was beaten by Canadian Peter Polansky 6-3, 7-6(5). For more coverage from a reporter onsite, see the Tennis East Coast blog. The two Pro Circuit events last week in the United States produced a familiar champion and a new one. Georgia's Anna Tatishvili, who won the tournament in Macon and was a finalist last week in Rock Hill, claimed the singles title at the $25,000 women's tournament in Florence, SC while in the $10,000 Futures in Birmingham, Ala., Romain Arneodo of France won his first singles title. No. 4 seed Tatishvili, a 23-year-old who has been as high as No. 50 in the WTA rankings, defeated No. 3 seed Madison Brengle of the US 6-2, 4-6, 6-4 in the final. Brengle did pick up a title, however, winning the doubles with former Pepperdine standout Anamika Bhargava. Brengle and Bhargava beat former Ole Miss teammates Kristi Boxx and Abigail Guthrie 7-5, 7-5, with neither team seeded. Arneodo, a 21-year-old whose previous success on the ITF men's circuit had all come in doubles, with seven titles in the past two years, defeated No. 2 seed Hans Podlipnik-Castillo of Chile 6-4, 1-6, 6-0 in the final, after beating top seed Chase Buchanan in the quarterfinals and 16-year-old Alexander Zverev of Germany in the semifinals. Arneodo and his partner Benjamin Balleret of Monaco won the doubles title, their fifth this year, with the top seeds beating No. 2 seeds Sekou Bangoura Jr. and Evan King 6-7(4), 6-4, 10-7. At the $50,000 women's tournament in Saguenay, Canada, 2011 French Open girls champion Ons Jabeur of Tunisia, seeded No. 7, defeated No. 2 seed CoCo Vandeweghe 6-7(0), 6-3, 6-3 in the final. WTA veterans Marta Domachowska of Poland and Andrea Hlavackova of the Czech Republic, the No. 2 seeds, defeated unseeded teens Vicky Duval and Francoise Abanda of Canada 7-5, 6-3 in the doubles final. This week, there is another $10,000 Futures, this one in Pensacola, Fla., for the men, along with the $75,000 Challenger in Charlottesville, Va. The women have a $50,000 event in New Braunfels, Texas, with another $50,000 challenger in Toronto also attracting many Americans. The qualifying for Pensacola, which was a 128 draw without any byes, finished today, with 17-year-olds Aron Hiltzik and Korey Lovett winning their fourth consecutive match to move into the main draw. Podlipnik-Castillo is the top seed, with main draw wild cards going to Deiton Baughman and Stefan Kozlov. The Charlottesville Challenger features as its top seed Tim Smyczek. Recent Virginia graduate Jarmere Jenkins received a wild card, as did current teammates Mitchell Frank and Mac Styslinger. Jenkins is playing Styslinger in the first round tonight, which is a rematch of a second round match the two played at the All-American last year. Styslinger won that contest 6-1, 6-4. Former Cavalier Somdev Devvarman of India is the No. 2 seed, and his teammate Ted Angelinos of Greece is also in the draw. Angelinos won his opening round match today over No. 6 seed Alex Kuznetsov 3-6, 7-6(3), 6-4. Free live streaming is available at usta.com. In New Braunfels, qualifying will finish on Tuesday, with recent USC graduate Danielle Lao in the final qualifying round. (Lao has written an article for Tennis Recruiting Network today about what to look for in a college coach.) Mariana Duque-Marino of Colombia, who won the Rock Hill $25,000 tournament, is the top seed. Main draw wild cards went to Jacqueline Cako, Rosalia Alda, Julia Elbaba and Ashley Weinhold. In Toronto, Timea Babos of Hungary is the top seed, with wild cards to Canadians Marie-Alexandre Leduc, Gloria Liang, Francoise Abanda and Elisabeth Fournier. Former Oklahoma State All-American Oleksandr Nedovyesov won the Kremlin Cup Challenger over the weekend, and those points put the 26-year-old Ukrainian in the ATP Top 100 for the first time in his career. Nedovyesov, who was the ITA Player of the Year in 2009, has won three Challenger titles this year and moved his ranking from 202 at the end of 2012 to 99 now. It looks like he'll appear in his first grand slam main draw in Australia in 2014. A lot going on today in the tennis world, so I'll save the Pro Circuit recap for Monday. For the first time since Ryan Harrison won the title in 2007, an American has won the championship at the ITF Grade A Osaka Mayor's Cup. Fifteen-year-old Michael Mmoh, who trains at the IMG Bollettieri Academy in Florida, defeated No. 14 seed Jumpei Yamasaki of Japan 6-2, 7-5. It was the first Grade A final appearance for the No. 2 seed, who had reached the quarterfinals of the tournament in 2012. No. 4 seed Ivana Jorovic of Serbia won the girls singles title, defeating top seed Varvara Flink of Russia 6-1, 6-4. 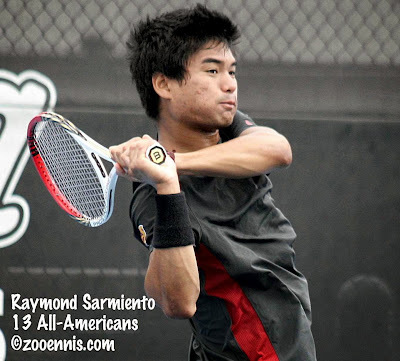 Due to all the rain during the week, Mmoh had to play two doubles matches after winning the singles; after he and partner Akira Santilian of Australia, seeded No. 3, won their semifinal, they met top seeds Duck Hee Lee of Korea and Simon Soendergaard of Denmark in the final, with Lee and Soendergaard posting a 6-3, 6-3 victory. The girls doubles title went to Shilin Xu and Xiaodi You of China, the No. 4 seeds, who defeated Japan's Kyoka Okamura and Australia's Olivia Tjandramulia, the No. 7 seeds, 6-1, 5-7, 10-5 in the final. For a complete account of the singles finals, see the ITF Junior website, which features quotes from Mmoh on his title. At the USTA Clay Court Invitational at Disney, USTA junior Peggy Porter and Roberto Quiroz of Southern Cal won the singles titles. Porter defeated 14-year-old Sofia Kenin 6-2, 6-2 in the women's final, which I was able to watch via the streaming provided on ESPN3. Kenin had some success with her excellent drop shot on the green clay, but her serve was shaky and she made more errors than usual. Porter seemed to handle the occasion better, although there were hardly any fans present to add ambience to the event. Just having television cameras present can be unnerving, but Porter played consistently well, attacking when she had the opportunity and staying in points as long as she needed to. Kenin double faulted on set point in the opening set, and continued to struggle with her serve, with Porter holding much more easily. Kenin did have one opportunity to get back on serve in the second set, with Porter serving at 4-2, 30-40, but Kenin missed a crosscourt forehand wide, Porter came back to hold, and Kenin was broken in the next game for the match, with Porter making a difficult overhead on match point. 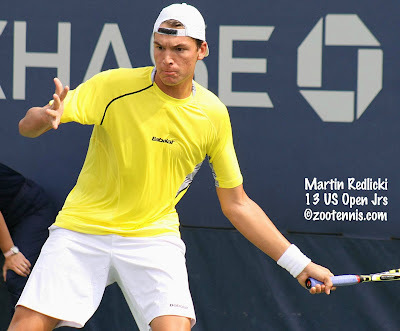 I was not able to watch the men's final, although I did see some of Martin Redlicki's 7-6(2), 6-2 semifinal win over Florida State's Cristian Gonzalez Mendez in the morning. Redlicki's serve was effective in that match, but the 6-foot-5 left-hander's advantage there didn't carry over to the final against Quiroz, who is also a left-hander. Quiroz, who had beaten teammate Max De Vroome 6-3, 2-6, 6-4 in the morning semifinal, showed no signs of fatigue in the final, beating Duke recruit Redlicki 7-5, 6-0. The men's doubles championships went to Tennessee's Brandon Fickey and Jarryd Chaplin, seeded 3-4, who defeated North Florida's Norbert Nemscek and Jack Findel-Hawkins, the No. 2 seeds, 7-6(4) in the final. For more on that final, see the Tennessee website. The women's doubles final was played Saturday night, with the top-seeded Texas A&M pair of Cristina Stancu and Stefania Hristov beating unseeded Marie Casares and Ashleigh Antal of Vanderbilt 8-5. Complete draws are available at the Florida State website. I mentioned earlier in the week the two Davis Cup relegation ties on the schedule this weekend, and while the current and former collegiate players making up most of the South African team went down to Russia 5-0, with 17-year-old Russia Karen Khachanov picking up a singles win Friday, it was another 17-year-old who made news today. 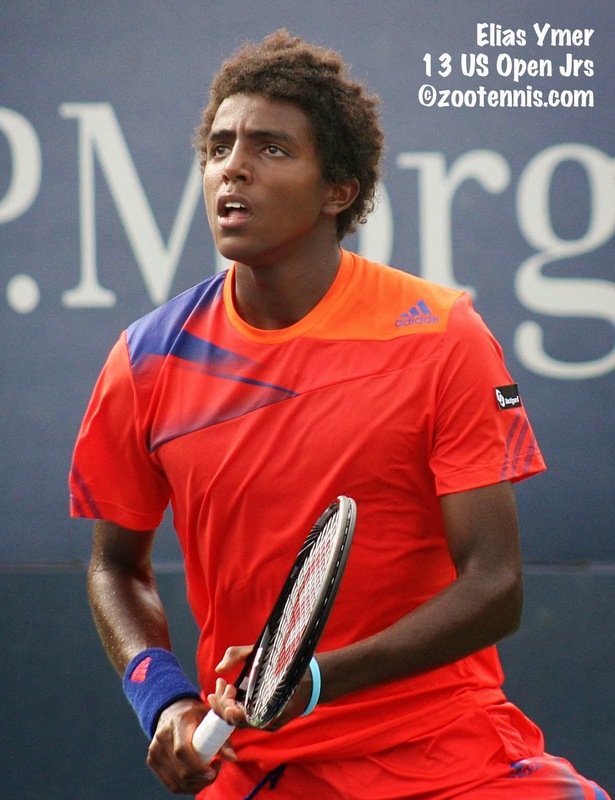 2012 Orange Bowl finalist Elias Ymer finished Sweden's dramatic comeback from 2-0 down, winning the fifth rubber over Martin Pedersen of Denmark 7-6(3), 7-6(8), 4-6, 7-5. For more on the Swedish heroics, which began with a doubles win by former college players Robert Lindstedt (Pepperdine) and Johan Brunstrom(SMU), see this article from the Davis Cup website. 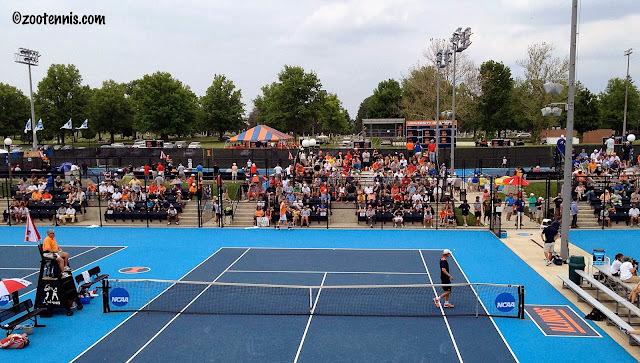 Last month I spoke with former Virginia All-Americans Treat Huey and Dom Inglot about their success as a doubles team for this Tennis Recruiting Network article. While they didn't specifically mention the World Tour Finals as a goal, they did talk about finishing the year strongly, and their title today in Basel keeps them alive in the hunt for one of the last three available spots in London next month. Huey and Inglot defeated another unseeded team, Julian Knowle and Oliver Marach of Austria, 6-3, 3-6, 10-4 to win their second ATP doubles title, and their first this year. For more on their title, and their prospects for London, see this article from the ATP website. Hannah King has had more than her share of serious injuries the past two years, but she says she is 100 percent now. Originally set to attend Duke, King recently committed to the University of Georgia for next fall. For more on her comeback from two shoulder operations and her decision to play for Georgia, see my article for the Tennis Recruiting Network. Last night I reported that Katrine Steffensen and Michael Mmoh had reached the quarterfinals of the ITF Grade A Osaka Mayor's Bowl in Japan. Both also made the semifinals today, but due to the typhoon that hit Japan, they were required to play both quarterfinals and semifinals today. Mmoh won both his matches, but Steffensen, the No. 9 seed, lost to Ivana Jorovic of Serbia in the semifinals 6-2, 6-1. Jorovic, seeded No. 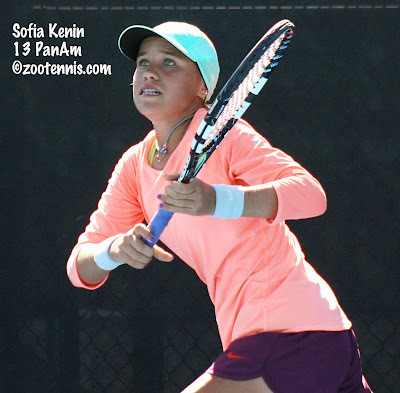 4, will play top seed Varvara Flink of Russia in the girls final. Mmoh, seeded No. 2, defeated No. 6 seed Harry Bourchier of Australia 4-6, 6-4, 7-5 in the quarterfinals and still had enough energy to take out unseeded Sora Fukuda of Japan 6-3, 6-1 later in the day. Mmoh will face No. 14 seed Jumpei Yamasaki of Japan in the first Grade A final for both the 15-year-old Mmoh and the 16-year-old Yamasaki. Mmoh is also still in the doubles, which are only as far as the semifinals. For more on Saturday's action at the Osaka Mayor's Cup, see this article from the ITF junior website. 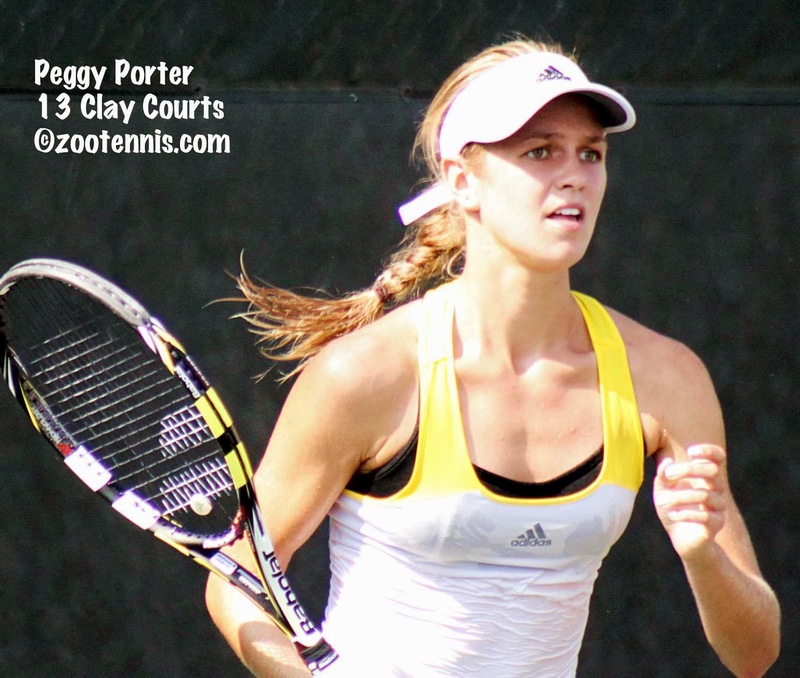 At the USTA Clay Court Invitational at Disney, two USTA girls will meet for the title Sunday. Seventeen-year-old Peggy Porter defeated future teammate Kourtney Keegan(9-16) of Florida 6-2, 6-1 in Saturday's semifinal, while 14-year-old Sofia Kenin outlasted Oklahoma State's Megan McCray(9-16) 6-7(6), 7-6(4), 6-3. The men's semifinals which will be played on Sunday, followed by the finals, feature three collegians and one junior. Southern Cal's Roberto Quiroz, the top seed, will face teammate Max de Vroome, a 9-16 seed, in the top half, with host Florida State's unseeded Cristian Gonzalez Mendez taking on Duke recruit Martin Redlicki in the bottom half. Redlicki advanced with a 6-1, 6-1 victory over fellow USTA junior Kalman Boyd. If you have access to WatchESPN, you can live stream the singles and doubles finals from 10 a.m. EDT. The men's semifinals are scheduled for 9 a.m., so I'm not sure how much if any of those matches will be shown. For complete draws, see the Florida State website. The women's draw at the USTA Clay Court Invitational at Disney was whittled down to four Friday, with two juniors--17-year-old Peggy Porter and 14-year-old Sofia Kenin--reaching Saturday's semifinals. The two college players who will oppose Porter and Kenin are freshman seeded 9-16: Florida's Kourtney Keegan and Oklahoma State's Megan McCray. 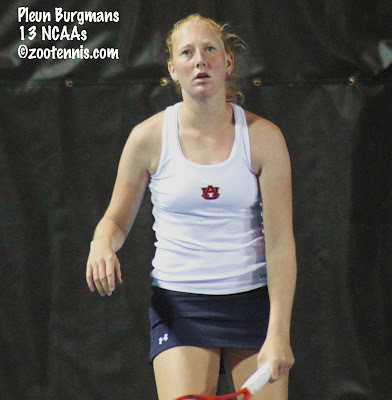 Keegan took down top seed Pleun Burgmans of Auburn in the third round this morning 7-6(5), 4-6, 6-2, then beat fellow 9-16 seed Lynn Kiro of Texas Tech 6-4, 6-3 in the day's second match. McCray also collected wins over two seeds, beating No. 7 seed Nikki Sanders 7-6(4), 4-6, 7-5 and then ousting No. 2 seed Daneika Borthwick of host Florida State 2-6, 7-6(4), 6-2. Porter began her day with a 6-4, 6-2 victory over Helen Altick of Vanderbilt, a 9-16 seed, then advanced past All-American semifinalist Cristina Stancu of Texas A&M 0-6, 6-1, 2-1 ret. Porter will play future teammate Keegan Saturday. Kenin recorded two more wins over seeded players, after taking out No. 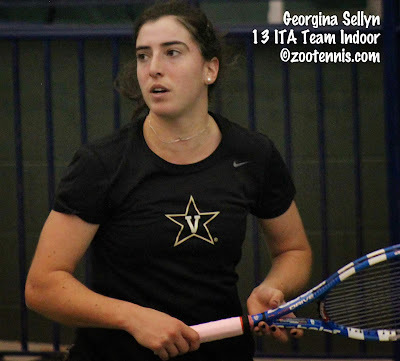 4 seed Georgina Sellyn of Vanderbilt on Thursday. This morning she defeated Stefania Hristov, a 9-16 seed from Texas A&M, 4-6, 6-0, 6-2, then beat Florida freshman Belinda Woolcock, also a 9-16 seed, 7-6(4), 6-3. Kenin will play McCray Saturday. The men's draw is down to the final eight, with two USTA juniors, Martin Redlicki and Kalman Boyd, among them. Boyd had the biggest win of the day, beating No. 2 seed and preseason No. 39 Stephane Piro of Florida 3-6, 6-2, 6-3 in this morning's second round. 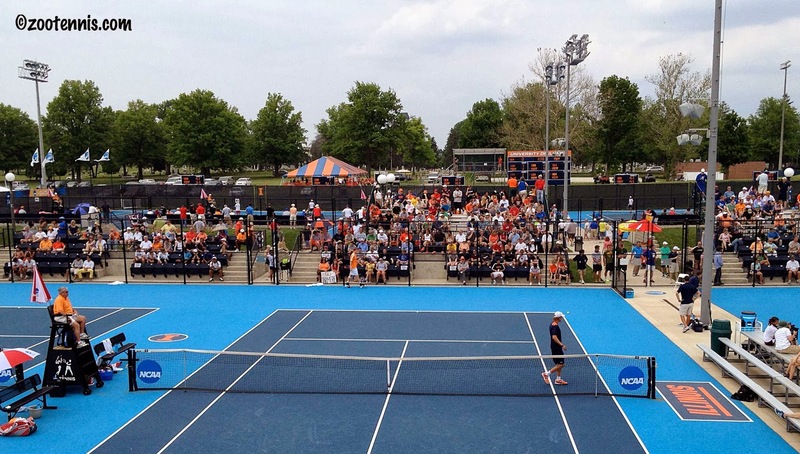 This afternoon Boyd defeated Illinois' Brian Page, a 9-16 seed, 6-2, 6-1. Redlicki, who did not face a seed today after beating No. 6 seed Eric Johnson of Southern Cal in the first round Thursday, defeated Stefan Menichella of Pepperdine 6-2, 6-4 and Grayson Goldin of Florida State 7-6(9), 6-0. Boyd and Redlicki will play each other for a place in Sunday's semifinals, assuring a junior gets some streaming time on ESPN3. 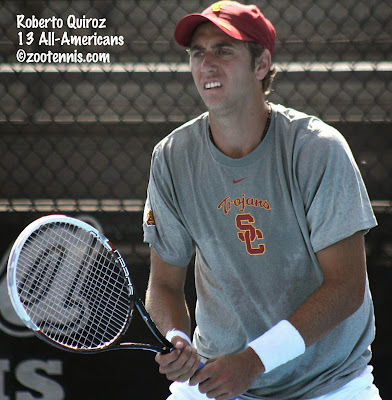 The other men's quarterfinalists include top seed Roberto Quiroz of Southern Cal and his teammate Max de Vroome, a 9-16 seed; No. 8 seed Quentin Monaghan of Notre Dame, who plays Quiroz Saturday; David Sofaer of Pepperdine, a 9-16 seed; and Cristian Gonzalez-Mendez of Florida State and Carlos Bautista of Tulsa, both unseeded. With the unseeded pair and the two juniors all in the bottom half, an unseeded player is certain to reach the final. Redlicki and Deiton Baughman are in the doubles quarterfinals, which will be played Saturday afternoon, followed by the doubles semifinals. There is only one round of singles scheduled for both men and women on Saturday. For the complete draws, see the Florida State website. It's been difficult to follow the ITF Grade A Osaka Mayor's Cup this week. In addition to the always problematic time zone changes, there has been a lot of rain, which cancelled play one day and sent matches inside at off-site locations Thursday and Friday, where a supertiebreaker was used to decide a match with split sets. Two US players reached the quarterfinals: Katrine Steffensen, seeded No. 9, and Michael Mmoh, the No. 2 seed. Mmoh is also into the quarterfinals of the doubles. At the ITF Grade 2 Uruguay Bowl this week, American Olivia Hauger reached the final, with the No. 5 seed losing there to No. 4 seed Leticia Vidal of Brazil 5-7, 6-3, 6-2. Hauger had beaten top seed Carolina Alvez of Brazil in the quarterfinals. Hauger and partner Cassandra Vazquez of Mexico, the top seeds, won the doubles title, beating No. 2 seeds Vidal and Rafaella Baquerizo of Ecuador 4-6, 6-3, 10-6 in the final. No. 6 seed Joao Menezes of Brazil won the boys singles title, beating top seed Marcelo Zormann, also of Brazil, 6-3, 6-1 in the final. After two rounds of singles at the USTA Clay Court Invitational at Disney, only seeded players should remain. Yet thanks to the USTA-selected junior girls, that number is 11, not 16, with five seeded college players falling to the teens in the opening day of play in Orlando. 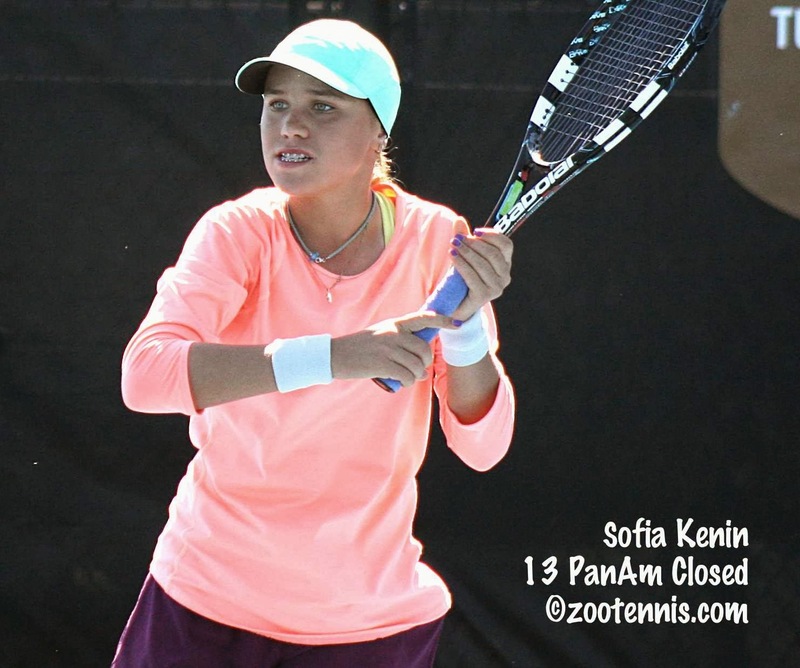 Sofia Kenin, who will not be 15 until next month, breezed past No. 4 seed Georgina Sellyn of Vanderbilt 6-0, 6-3 in the second round. Sellyn, a sophomore, had just come from winning the Ohio Valley Regional in Memphis on Tuesday. Alexis Nelson, who turned 15 in August, started out with a 6-1, 6-3 win over Florida State's Kerrie Cartwright, a 9-16 seed, and then beat Saana Saarteinen of Tulsa 6-1, 6-2 to reach the third round. Jessie Aney, another Minnesota-based 15-year-old, eliminated No. 5 seed Paula de Man of Auburn 6-1, 6-7(8), 6-0 in the second round. Florida recruit Peggy Porter, who turns 18 next month and is the oldest of the USTA junior girls, lost only five games in her two wins today, beating No. 8 seed Michaela Bezdickova of New Mexico 6-1, 6-3 in the second round. Mia Horvit defeated Yelena Nemchen of Tulsa, a 9-16 seed, 7-5, 6-2 in the first round, but lost to Florida freshman Stefani Stojic 7-6(3), 6-1 in the second. Top seeds Pleun Burgmans of Auburn and Daneika Borthwick of Florida State both won their second round matches (after byes in the first round) in straight sets. Nelson was the only junior girl to win all three of her matches Thursday, as three of the four USTA doubles teams were beaten. Nelson and Erica Oosterhout advanced to the second round, where they will meet top seeds Cristina Stancu and Stefania Hristov of Texas A&M. The men played only one round of singles Thursday, with five USTA boys picking up wins. Sameer Kumar, Tom Fawcett, Mitch Stewart, Kalman Boyd and Martin Redlicki won their first round matches, with Redlicki posting a 7-5, 6-1 victory over No. 6 seed Eric Johnson of Southern Cal. Two of the four junior doubles teams advanced to the second round, with Stewart and Fawcett beating Grayson Goldin and Michael Rinaldi of Florida State 8-2 and US Open boys doubles champion Redlicki and Deiton Baughman defeating Quentin Monaghan and Eric Schnurrenberger 8-3. The schedule has two rounds of singles for both men and women on Friday. For complete results, see the Florida State website. At the $25,000 Pro Circuit event in Florence, SC, 17-year-old Christina Makarova has reached the quarterfinals, matching her best showing at that level. After posting wins over former college All-Americans Sanaz Marand and Jacqueline Cako at the $25,000 tournament in Redding last month, Makarova qualified this week, and has beaten Ana Sofia Sanchez of Mexico and No. 8 seed Petra Rampre of Slovenia, ranked 203. Makarova will play No. 3 seed Madison Brengle in Friday's quarterfinals. Sixteen-year-old Francoise Abanda, who lost to Melanie Oudin last week in the $25,000 Rock Hill Pro Circuit event, will have a chance for revenge this week on her home soil at the $50,000 Saguenay Canada tournament. Abanda, a wild card who just began competing again in September after a shoulder injury kept her out of action for most of 2013, beat No. 8 seed and WTA No. 189 and USTA National junior champion Sachia Vickery 7-6(3), 6-2 in the second round today. Oudin, the No. 3 seed, advanced with a three-set win over Canadian Gabriela Dobrowski. World junior No. 2 Alexander Zverev of Germany reached the quarterfinals of the $10,000 Futures tournament in Birmingham, Alabama today, beating Connor Farren 6-3, 6-1. 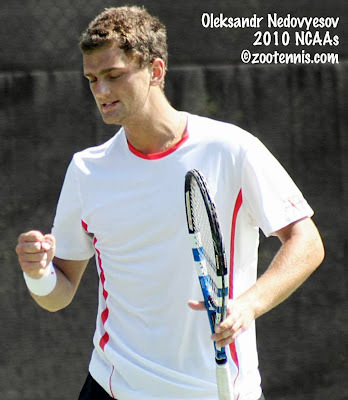 Current University of Alabama player Daniil Proskura has also advanced to the quarterfinals. The USTA Clay Court Invitational at Disney begins Thursday at the ESPN Wide World of Sports complex in Orlando, with Florida State serving as the hosts for the second annual tournament. Last year, the clay court event, which also features eight USTA-sponsored juniors, was men only; this year, women have also been invited, including eight junior girls selected by the USTA. My post on the juniors selected is here (Mary Haffey has since been added). This year the format is also new, with no flights, just a 64-draw with byes for the seeds, all of whom are college players. Stancu and Hristov are the top seeds in women's doubles, with Cotrone and Blake Davis No. 1 in the men's doubles draw. The women's schedule is here, but I don't have the complete men's schedule at the moment. The USTA release on the tournament and the ten hours of ESPN3 coverage being provided on Sunday says the men's semifinals are Sunday and will be included in the live streaming, along with all finals in both singles and doubles. The complete draws are available at the Florida State website. The USTA/ITA Regional Championships wrapped up today, with all but one of the nine singles and nine doubles titles decided. That one is the Northeast men's doubles final, which will take place on Wednesday on the campus of Cornell, the home courts of both finalists. The other 17 berths in next month's USTA/ITA Indoor Intercollegiate championships were decided today, and three of them went to Columbia, which serves as the host school for the tournament held at the USTA Billie Jean King National Tennis Center in New York. Winston Lin of Columbia won the Northeast men's double title, defeating No. 2 seed Denis Nguyen of Harvard 3-6, 6-3, 6-1. The Columbia women swept the titles, with sophomore Kanika Vaidya downing senior Bianca Sanon in two tiebreakers in the singles final, and Tina Jiang and Crystal Leung taking out Vaidya and Sanon in another tiebreaker in the doubles final. With Columbia also receiving men's and women's wild cards in singles and doubles there will be plenty of players getting hometown fan support. At the men's Northwest regional, Cal swept the titles for the second year in a row. Campbell Johnson defeated Pacific's Sem Verbeek 6-1, 6-4 in the singles final, with Gregory Bayane and Chase Melton taking the doubles title with a 8-5 win over Washington's Emmett Egger and Jeff Hawke. Stanford swept the titles at the women's Northwest Regional, with Kristie Ahn claiming the singles title with a 6-4, 6-2 victory over St. Mary's Jenny Jullien. Ahn and partner Carol Zhao lost to teammates Ellen Tsay and Taylor Davidson 8-6 in the doubles final. Barring any wild cards, the only player from the Virginia men's team in New York will be All-American champion Mitchell Frank, after none of the other Cavaliers reached the latter stages of the regional. Carlos Lopez Villa of Old Dominion won the singles title, beating Virginia Commonwealth's Alexis Heugas 6-3, 6-3. The doubles title went to Liberty's Shea Thomas and Jorge Azuero, who won the first ever regional title for the Lynchburg, Va. school with a 4-6, 7-5, 6-4 decision over Virginia Tech's Andreas Bjerrehus and Amerigo Contini. I have no idea why that final was best of three, when all the other doubles finals were the 8-game pro set. Virginia will be well represented in the women's draw however, with Danielle Collins winning the singles title and Rachel Pierson and Julia Elbaba taking the doubles championship. Collins, who received the USTA wild card at last year's Indoor as a freshman at Florida, earned her place this year with a 6-2, 6-0 win over Pierson in the final. Elbaba, who is already in the singles draw after winning the All-American consolation tournament, and Pierson defeated Maria Belaya and Jeltje Loomans of William & Mary 8-2 in the final. At the women's Ohio Valley regional, Vanderbilt's Georgina Sellyn defeated Nadia Ravita of Kentucky 6-3, 6-2 in the singles final, with Julia Fellerhoff and Rebecca Shine of Louisville taking the doubles title with an 8-5 win over Alyssa Hibberd and Caroline Wegner of Memphis. At the men's Texas regional, Baylor's Diego Galeano assured himself a place in New York, defeating Texas A&M's Shane Vinsant 4-6, 6-4, 7-5. Lloyd Glasspool and Soren Hess-Olesen of Texas, who fell short of an automatic berth when they lost in the All-American doubles consolation final, seized their second chance, defeating Junior Ore and Jackson Withrow of Texas A&M 8-7(6). Finally, in the men's Southwest regional, Southern Cal swept the titles, with Yannick Hanfmann downing Alex Sarkissian of Pepperdine 6-3, 4-6, 6-0 in the singles final, while Eric Johnson and Max de Vroome took the doubles title with an 8-4 win over teammates Raymond Sarmiento and Roberto Quiroz. The New York Indoor fields are not yet complete, with the wild cards and at-large bids yet to be announced, but CollegeTennisOnline has compiled a list of those who have qualified to date here. There isn't much going on in Davis Cup this weekend, but there are a couple of relegation ties in the Group I Europe/Africa zone. Russia will play South Africa, with the latter calling on one current and two former college players to avoid dropping to Group II. Nik Scholtz of Ole Miss played for South Africa last month in their 4-1 loss to Slovenia, but is not playing this weekend, although Ole Miss will be represented in former Rebel Tucker Vorster. 2013 NCAA semifinalist Japie De Klerk, a senior at Tulsa, is in Moscow for the tie, along with former Georgia Tech player Dean O'Brien. For more on Vorster and De Klerk, both Davis Cup rookies, see this article. Keeping up with changes in NCAA regulations is not easy, and the recent one allowing juniors to accept prize money from pro tournaments while retaining their amateur status is one of the more radical revisions. Previously, juniors could not accept prize money while playing a professional event, only reimbursement for expenses, but now that has changed to allow juniors to earn as much as $10,000 a year. Once a player begins college, he or she can still accept prize money, but it must not exceed what the NCAA calls "actual and necessary expenses." Today the Tennis Recruiting Network provides a more detailed look at the rule change, and I urge every junior, parent and coach to read it. Do not leave money on the table based on the previous restrictions if you intend to compete at any of the many Pro Circuit events around the country. Heaven knows you spend enough as it is. The fields for next month's USTA/ITA Indoor Intercollegiate Championships in New York are really starting to take shape now, with the conclusion of many of the USTA/ITA Regional championships today. In the men's Mountain regional, which finished yesterday, Denver's Henry Craig earned his berth in New York, defeating New Mexico's Sam Iftikhar 4-6, 6-3, 6-2. An Idaho team will be in New York for the second straight year, with Jose Bendeck and Cristobal Ramos earning their spot with a win in the final over Boise State's Brendan McClain and Garrett Patton. At the Central regional in Tulsa, Oklahoma's Axel Alvarez defeated teammate Dane Webb 6-3, 6-3, and will join Sooner Guillermo Alcorta in New York. Alcorta's invitation to the Indoor came via his showing at the All-American Championships, where he reached the final. Drake's Robin Goodman and Ravi Patel won the doubles title, defeating Minnesota's Mathieu Froment and Jack Hamburg. It's odd to have a Carolina regional without a Duke or North Carolina champion, but that's the case this fall, with Eastern Carolina's Joran Vliegen becoming his school's first regional champion. Vliegen defeated UNC's Brett Clark 7-5, 6-4 in today's final. In doubles, UNC-Wilmington's Rafael Aita and Sam Williams earned the bid to the Indoor Championships, defeating North Carolina State's Robbie Mudge and Sean Webber. 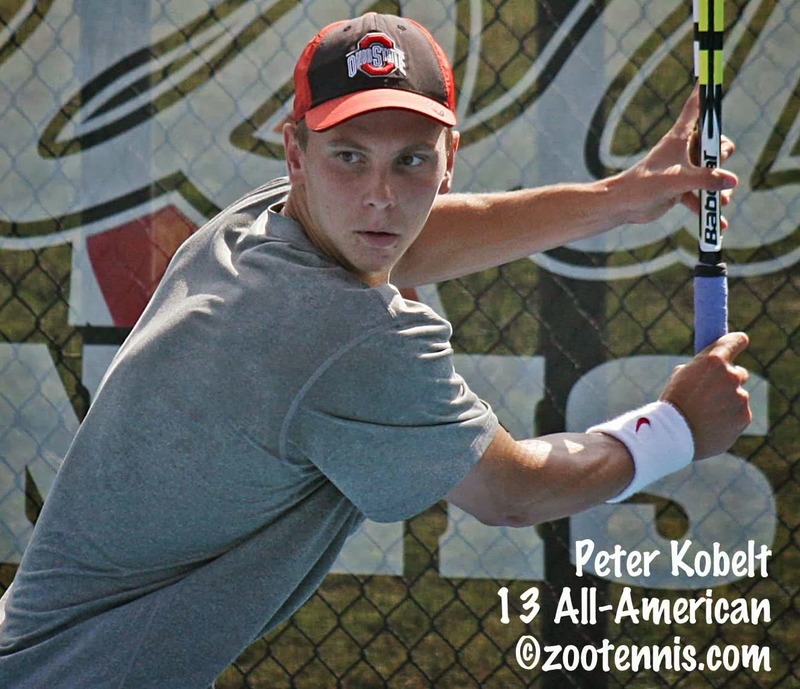 Ohio State's Peter Kobelt had something of a disappointing start to his senior season at the All American Championships, losing in the first round of both singles and doubles, but he will be in New York for both after two titles won in tiebreakers today. 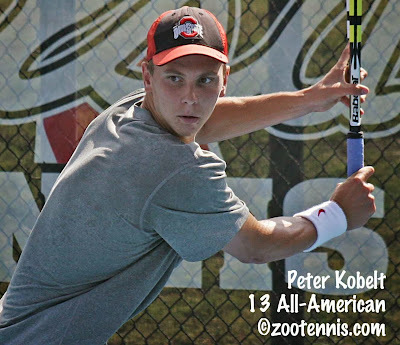 Kobelt, who also won the Midwest regional in 2012, beat Greg Andrews of Notre Dame 6-4, 5-7, 7-6(2) in the singles final. Kobelt and Kevin Metka won the doubles title with a 8-7(5) victory over Andrews and Alex Lawson. Finals in the men's Northwest, Southwest, Texas, Northeast and Atlantic regionals are Tuesday. 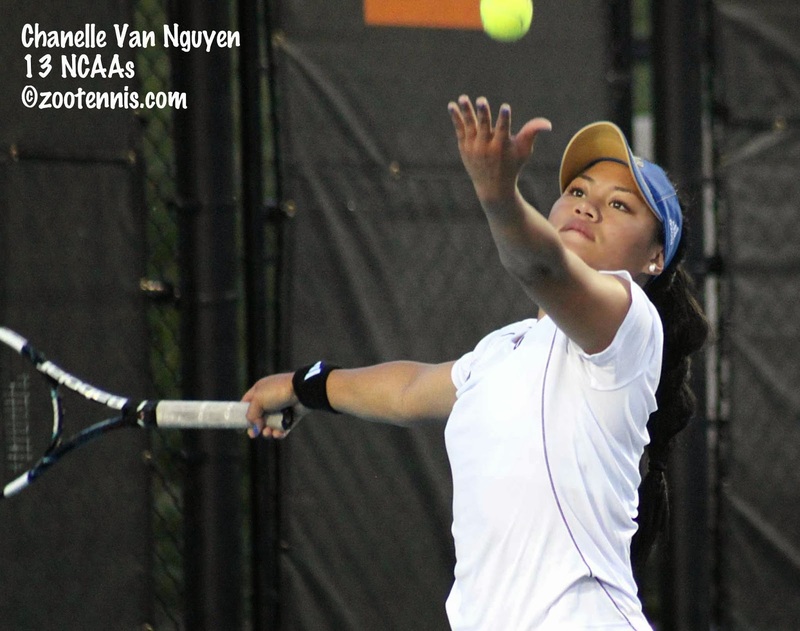 UCLA swept the Southwest regional, with Chanelle Van Nguyen taking the singles title by virtue of a 6-4, 6-2 win over teammate Jennifer Brady. Brady and Catherine Harrison won the doubles title, beating USC's Brynn Boren and Zoe Katz. Brady had already qualified for New York after winning the All-American doubles title with Robin Anderson, so it will be interesting to see how that shakes out in the next couple of weeks. Van Nguyen is having an outstanding fall, winning six matches at the All-American before falling to eventual champon Jamie Loeb in the first round, then taking the regional title. At the Texas regional, the champion is Cristina Stancu of Texas A&M, who already had qualified for the Indoor as an All-American semifinalist. Stancu defeated Baylor's Kiah Generette 6-2, 6-1 in the final. Texas's Breaunna Addison and Pippa Horn won the doubles title over Stancu and Stefania Hristov. According to this article from the Duke website, the Carolina regional women's final between No. 1 seed Beatrice Capra of Duke and No. 2 seed Hayley Carter of North Carolina was quite a battle, with Capra coming from a set and a break down to defeat the Tar Heel freshman 3-6, 6-4, 6-4 in a three-hour match. Carter did end up earning a trip to New York however, teaming with ITA All-American champion Jamie Loeb to win the doubles title over teammates Laura Slater and Kate Vialle. At the Southern regional, it was all Auburn in both finals. Pluen Burgmans defeated teammate Emily Flickinger 6-3, 6-0 in the singles final, with Burgmans and Flickinger winning the doubles title with an 8-4 victory over teammates Jackie Kasler and Jen Pfiefler. In the Southeast regional, Georgia's Silvia Garcia defeated Florida Alex Cercone 7-6(2), 6-1 in the final, with Georgia Tech's Kendal Woodard and Megan Kurey taking the doubles title over Georgia's Lauren Herring and Maho Kowase. The Central regional singles title went to Oklahoma State's Kanyapat Narattana, who beat Oklahoma's Hermon Brhane 3-6, 6-1, 6-1. Oklahoma's Whitney Ritchie and Mia Lancaster took the doubles title over Arkansas's Yang Pang and Kimberly-Ann Surin. The finals in the women's Northwest, Northeast, Atlantic and Ohio Valley regionals are Tuesday. For a list of the Indoor qualifiers to date, see this CollegeTennisOnline page. For a more detailed look at the results from all this weekend's regionals, click here. University of Oklahoma freshman Andrew Harris captured his first ITF Men's circuit title today at the $15,000 Futures event in Mansfield, Texas. 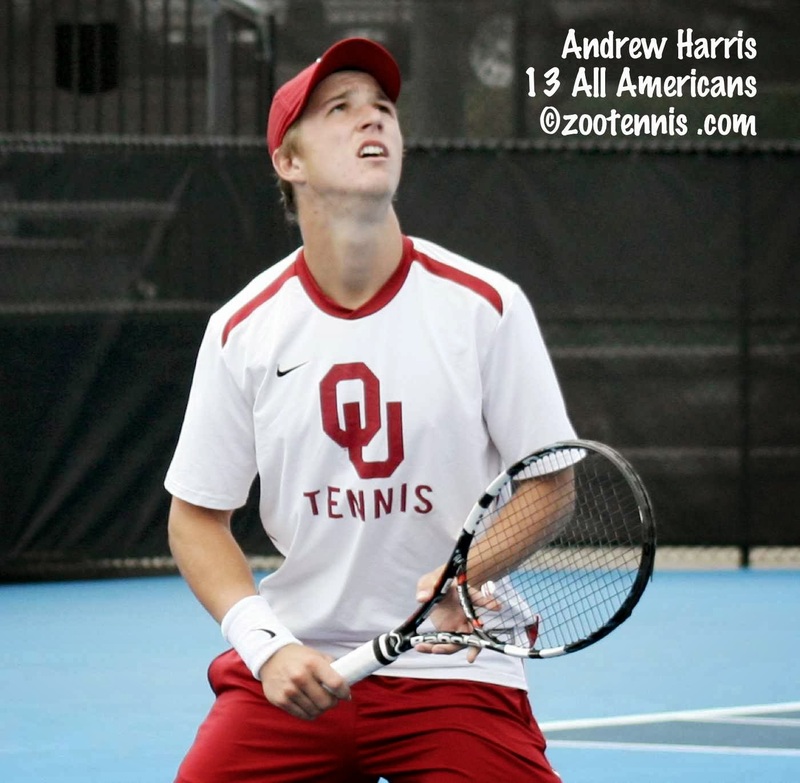 Harris, a 19-year-old Australian who reached the doubles semifinals at the ITA All-American Championships earlier this month, defeated former Illinois All-American Dennis Nevolo 6-4, 7-6(5) in the final. Neither player was seeded. Harris, who won the Wimbledon and French boys doubles titles last year with Nick Kyrgios, defeated top seed Austin Krajicek(Texas A&M) 7-5, 7-5 in the semifinals to reach his second Futures final. Third seeds Ed Corrie(Texas) and Dan Smethurst of Great Britain took the doubles titles in Mansfield, defeating top seeds Jean-Yves Aubone(Florida State) and Kevin King(Georgia Tech) 6-3, 7-5 in Sunday's final. Next up for the men's Pro Circuit is the $10,000 Futures in Birmingham, Alabama. Chase Buchanan, back in the United States after several successful months in South America, is the top seed, and has drawn former teammate Devin McCarthy in the first round. Buchanan is one of four wild cards. The others are Alabama sophomore Becker O'Shaughnessey, Alabama recruit Sam Edwards and Kentucky recruit Trey Yates. At the $25,000 Women's Pro Circuit event in Rock Hill, SC, top seed Mariana Duque-Marino of Colombia swept the singles and doubles titles. Duque-Marino defeated No. 5 seed Anna Tatishvili of Georgia 6-3, 6-4 in the singles final, then joined with Argentina's Maria Irigoyen to beat unseeded Allie Kiick and Asia Muhammed 4-6, 7-6(5), 12-10 in the doubles final. The women's Pro Circuit moves to Florence South Carolina for another $25,000 event, although many American women are headed north to Canada for the $50,000 tournament there the same week. At the ITF Grade 2 Dunlop Japan Open, top-seeded 15-year-olds Duck Hee Lee of Korea and Priscilla Hon of Australia claimed the titles. The biggest tournament on the ITF junior Asian swing-the Grade A Osaka Mayor's Cup--begins Monday with qualifying already underway. Two US boys--Michael Mmoh, the No. 2 seed, and Daniel Maese--are in the draw, with Mmoh defending quarterfinal points from last year. Three US girls have made the trip: No. 9 seed Katrine Steffensen, No. 12 seed Michaela Gordon and Emma Higuchi. Russia's Vavara Flink is the girls top seed, with Duck Hee Lee at the top of the boys draw. Several deadlines for the upcoming major junior events in Florida are approaching. The deadline for the Eddie Herr 12s, 14s, and 16s, was earlier this month, but the deadline for its ITF Grade 1 event, which begins December 2, is not until November 5th. 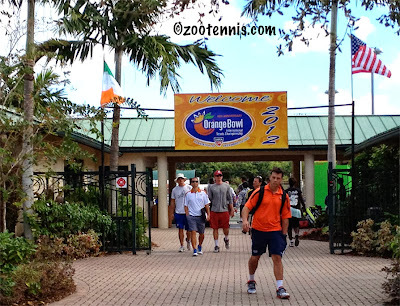 Although the ITF Grade A Orange Bowl, apparently with a new sponsor in Metropolia, takes place a week after the Eddie Herr, the Orange Bowl entry deadline is a week earlier: October 29. The current entry lists for the 16s are posted on the tournament website. Sameer Kumar, Kyle Seeling. Chan-Yeong Oh, Claire Liu and CiCi Bellis are prominent names already entered. Entries for the Junior Orange Bowl 12s and 14s competition, held from December 17-23 in Miami, are due Thursday, October 24, 2013. World No. 3 Andy Murray, the 1999 12s champion, is serving as the Honorary Chairman of the event this year. Last month I posted on the move of the Grade A Abierto Juvenil Mexicano, traditionally the first tournament of the new year, to a place on the calendar after the Orange Bowl in December. I had thought that would mean an extra Grade A for 2014, but it will not. The tournament will not be held this December at all, with the Costa Rica Grade 1 the first major ITF junior tournament of 2014. Players with points to defend from last December's Abierto Juvenil will not have to do so until December 2014, meaning a good showing there last December will stay on their record for nearly two years, if they are still age-eligible in 2014. The ITF junior schedule for January-June of 2014 is available here, and there are no new US tournaments on it, with Claremont (Grade 4), Carson(1), Easter Bowl(B1), Delray Beach(4), Plantation(4), Daytona Beach(4) and Philadelphia(4) the seven US-based tournaments. Speaking of extra Grade A's, however, there will be one in 2014: the Youth Olympic Games. The first such competition was held in 2010 in Singapore, and because it was in Southeasty Asia in August, just after the USTA National Championships, there was no US presence in the tennis competition. That may be the case again next year, with the tournament in Nanjing, China from August 16-28. Not only is the tournament a Grade A, but it offers bonus points as well, so it can be quite lucrative for those who make the long trip, or live in the vicinity. Some of you might be wondering what happened to the new USTA Masters tournament planned for late October in the revised junior competition schedule (explanation of event in pdf here), as I know I was. I was told, due to scheduling conflicts, that it might be held in November or December instead. The $15,000 Futures tournament in Mansfield, Texas this week was plagued by rain early in the week, but they've managed to get back on schedule with the quarterfinals completed today. Fifteen-year-old Stefan Kozlov, who had gotten his third straight win over Germany's Alexander Zverev, the ITF's No. 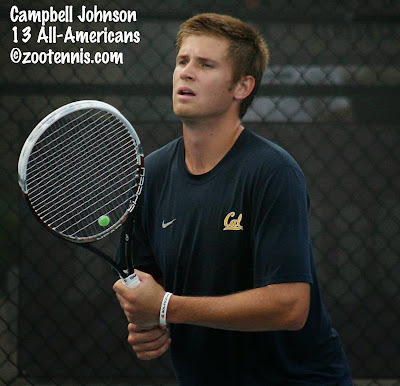 2-ranked junior, Thursday, lost to top seed Austin Krajicek 6-3, 6-2. 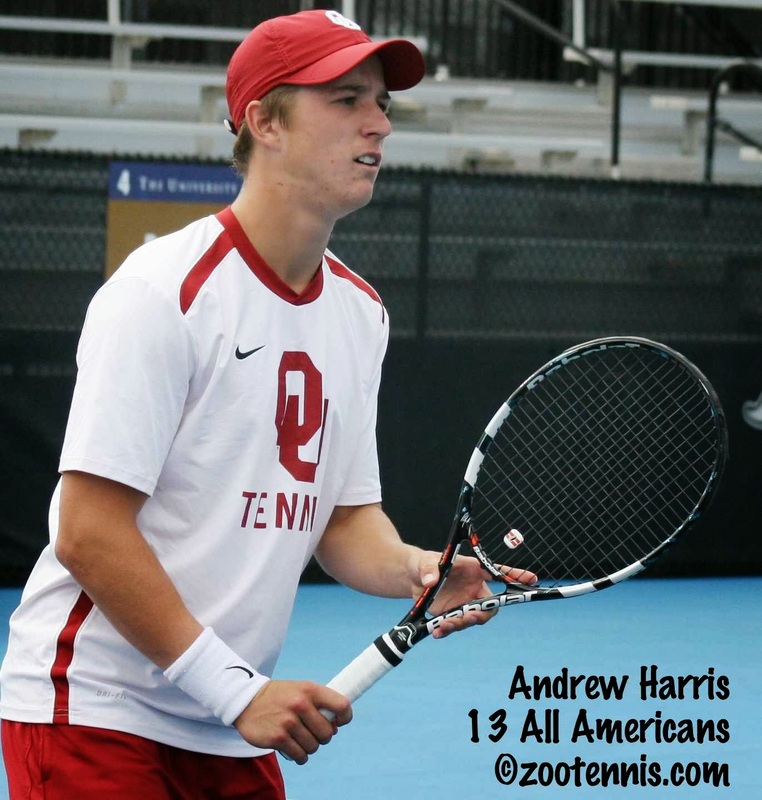 Former Texas A&M All-American Krajicek's opponent in the semifinals is University of Oklahoma freshman Andrew Harris of Australia, who defeated No. 6 seed Joshua Milton of Great Britain 6-2, 7-6(3). Former Illinois All-American Dennis Nevolo, who is unseeded, knocked of last week's champion Jeff Dadamo in today's quarterfinal 7-6(3), 6-4, and will play TCU junior Arnau Dachs of Spain in the semifinals. Dachs defeated Oklahoma State junior Jakob Sude of Germany 6-2, 6-3 in the quarterfinals. Not to make too much of one Futures result, but it's interesting to note that neither Dachs nor Harris managed to qualify for the ITA Men's All-American Championships earlier in the month. Harris, who won two junior slam doubles titles in 2012, made it to the third and final round of qualifying before losing to Daniil Proskura of Alabama, but Dachs lost in the first round of qualifying. That two weeks later they could both reach the semifinals of a Futures speaks to the depth of the men's college game right now. Harris isn't in the draw of the Central regional, so he will not be at the USTA/ITA Indoor Intercollegiate Championships in New York next month unless he gets a wild card. (Corrected to note Dachs is in Texas Regional). The remaining USTA/ITA Regional Championships have begun across the country with two notable absences. At the men's Southwest Regional hosted by Pepperdine, UCLA's Marcos Giron is not competing due to a hamstring injury suffered in the Tiburon Challenger last week, and at the Atlantic Regional hosted by Virginia Tech, preseason No. 2 Alex Domijan of Virginia is not in the field due to a recent foot injury. So if their health allows, both of them will also need wild cards to compete in the Indoors in New York. It's good to see women's preseason No. 1 Sabrina Santamaria of USC back in action after missing the All-American Championships with an injury, as the top seed in the Southwest Regional in San Diego. For more links to regional tournament hubs, see the ITA's Regional results page. 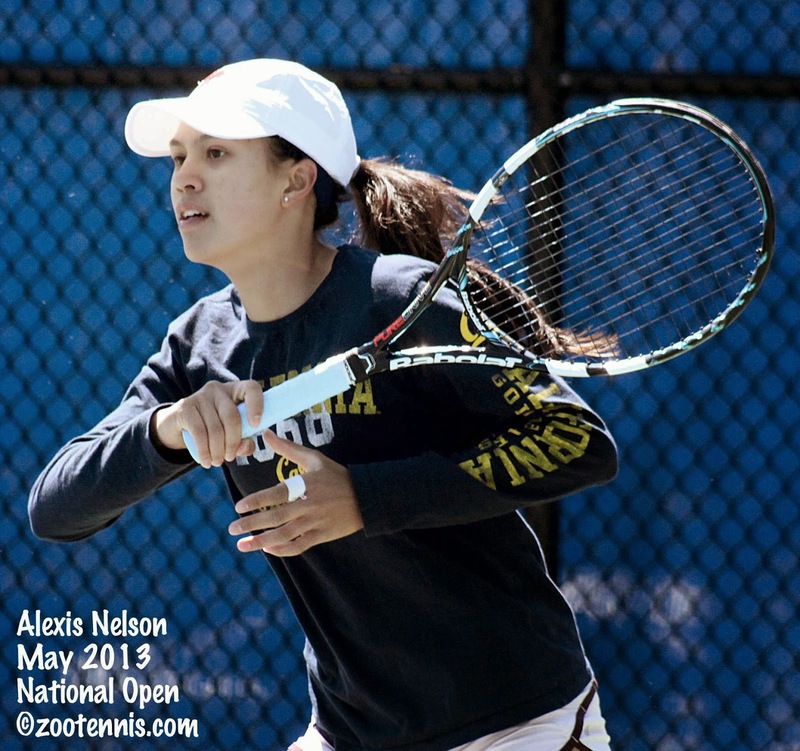 The Tennis Recruiting Network has kicked off its countdown to signing day coverage, and on the site today is the updated list of blue chip commitments for 2014. It seems to me there are more uncommitted players than usual, but the next few weeks could change that in a hurry. Qualifying for the two ATP events next week begins Saturday with Jack Sock, Denis Kudla and Michael Russell among the 16 competitors in the Basel ATP 500 tournament vying for four spots in the main draw. A less familiar name appears as one of the 16 players in qualifying for the ATP 500 in Valencia, 18-year-old Texan Bayo Philips, who received a wild card. 2013 graduate Philips is apparently not attending college, as he is showing as a client on this sport agency's website. Today's post wraps up last week's ITF Grade B1 in Tulsa, one of the four biggest (in terms of points on offer) ITF junior tournaments in the United States. (The others are Easter Bowl, Orange Bowl and US Open Juniors.) My written recap of the tournament, which featured some of the best weather I can ever remember in Tulsa, can be found today at The Tennis Recruiting Network. The slideshow of singles quarterfinalists and doubles semifinalists is below, and brief videos of the four finalists, starting with champions Tornado Alicia Black and Francis Tiafoe, follow. No. 72 Albert Ramos of Spain in the first round of the Moscow ATP 250 this week. Today, the ATP No. 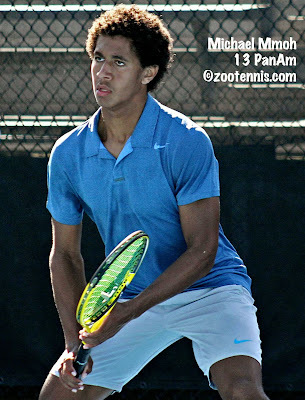 808, who lost to Kalamazoo 18s champion Collin Altamirano 6-4, 6-4 in the second round of the US Open Junior Championships last month, broke into the mainstream tennis consciousness with a 6-4, 6-4 victory over No. 3 seed and ATP No. 27 Janko Tipsarevic to reach the quarterfinals. According to ATP stats guru Greg Sharko, Khachanov is the first 17-year-old to reach an ATP quarterfinal since Kei Nishikori of Japan did it in Indianapolis in 2007. For more on Khachanov's win, see this article from Eurosport. Last year, the inaugural Clay Court Invitational, hosted by the USTA and Florida State, brought together junior boys and college players to compete against each other at the ESPN Disney clay court facility in Orlando, Florida. This year, the event has gone co-ed, with both men's and women's teams and junior boys and girls participating in the October 24-27 competition. The women's college teams sending players are: Florida, Texas A&M, Duke, Texas Tech, Vanderbilt, Florida State, Auburn, Oklahoma State, Tulsa, South Carolina, Central Florida and New Mexico. The men's college teams sending players are: Southern California, Tennessee, Pepperdine, Kentucky, Florida, Illinois, Tulsa, Notre Dame, Florida State, University of North Florida, Georgia Tech, Central Florida and South Alabama. Although there may be some last-minute changes due to injuries, etc., the USTA juniors competing are listed below. According to this release from the Florida State Sports Information Department, my source for the college participants, ESPN3 will provide television coverage of the event on the weekend. Most of the 24 USTA/ITA Regional Championships begin later this week, but five were held in the past few days, with two women and three men earning spots in the USTA/ITA Indoor Intercollegiate Championships November 7-10, 2013. Two of the finals featured the always awkward teammate vs teammate contest, both on their home courts, with Michigan's Ronit Yurovsky defeating Emina Bektas in Ann Arbor, and Tennessee's Hunter Reese downing Mikelis Libietis in Knoxville. By making the regional final, preaseason No. 1 Libietis, who retired up 6-4, 1-3, is virtually assured of an at-large bid to New York, but Bektas, who lost 6-1, 1-6, 6-3, is No. 25 in the preseason rankings, although she is likely to get an at-large bid based on her quarterfinal appearance at the All-American Championships. Lucia Batta(2) of UNLV won the Mountain Regional, defeating Nevada-Reno's Michelle Okhremchuk(5) 7-5, 6-3 in the final. Keeping with the theme of no No. 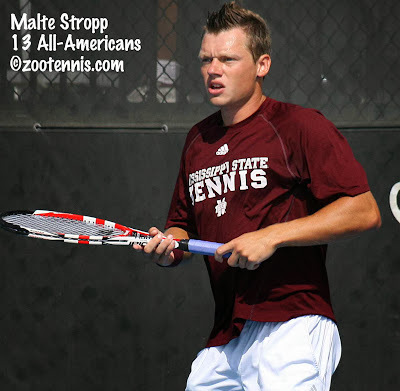 1 seeds collecting titles, Malte Stropp of Mississippi State, the No. 3 seed, defeated top seed Nik Scholtz of Ole Miss 7-6(4), 6-2 to win the Southern Regional. With a No. 7 preseason ranking, Scholtz has a good chance to get an at-large bid to New York, although there are only six at-large bids available for the men. In the Southeast Regional, Georgia's Nathan Pasha, the No. 2 seed, beat unseeded South Florida freshman Sasha Gozun 6-1, 6-2 in the final. Gozun, just 17, defeated top seed Ben Wagland of Georgia in the second round, and also beat No. 8 seed Mike Alford of Florida en route to the final. Pasha didn't lose a set in his six victories. College Tennis Online has an up-to-date look at the current qualifiers, including the regional doubles winners, and also lists the remaining openings for the Indoor championships here. For an explanation of the IIT selection criteria, which differs for the men and women, see this page on the ITA website. Denis Kudla, who made the long trek from the Tiburon Challenger Saturday to the ATP 250 in Moscow, where he plays his first round match tomorrow against Croatia's Ivo Karlovic, was asked about the state of American men's tennis while in Northern California. Kudla says, in this article by Paul Bauman, "If you look at other big federations -- the French, the Spanish -- they don't have anyone 19, 20, 21. They may have one guy. We have maybe six, seven, even more than that coming up. Maybe in the next three or four years, I think something good is going to happen with American tennis." Kudla, who is now ranked 95, has been between 90 and 120 since May. Speaking of rankings, one of my weekly must-reads is Challenger Tennis's Rankings Watch, which provides a list of players in the 60-300 ranking range who have achieved a career-high ATP ranking. This week, US players reaching career highs include Tim Smyczek, Bjorn Fratangelo and Chase Buchanan, and former collegiate players on the list include Slovenia's Blaz Rola (Ohio State), Australia's JP Smith (Tennessee), and Greece's Ted Angelinos(Virginia). Linda Pearce, the Australian journalist at The Age, has a long feature on John Peers, the former Middle Tennessee State and Baylor standout, who now has the highest ATP ranking of any Australian male, with his doubles ranking of 29. Peers, who along with Jamie Murray of Great Britain is still in the running for the World Tour Finals in London next month, says he was never concerned about falling behind his contemporaries by attending college in the US. ''I was never worried about that. I always knew that you're not really peaking in tennis now until you're 25 to 30. Some of these top guys are pushing it. A couple of these doubles guys are pushing 40 now, so the game's become a lot more physical and a lot more things are happening, so [durability] is a big thing." The current ATP doubles team rankings for the Barclay's ATP World Tour Finals, where the Top 8 teams qualify, can be found here. The slideshow below features the St Francis Health System ITA Men's All-American Championships singles quarterfinalists, the doubles semifinalists and the consolation finalists in both singles and doubles. 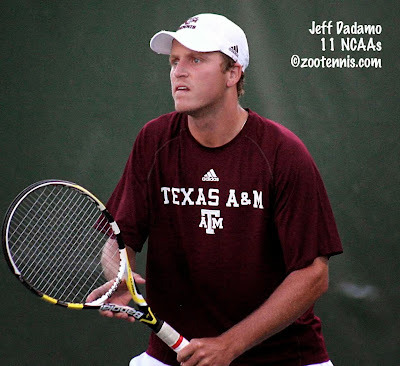 My recap of the tournament for the Tennis Recruiting Network can be viewed here. Because the camera I normally use for videos is in for repair, I didn't make separate videos of Mitchell Frank and Guillermo Alcorta in the finals, but I hope there is enough footage of both in the video below. The next week or so will be about filling the field for the USTA/ITA Indoor Intercollegiate Championships, which will be November 7 through November 10 at the USTA Billie Jean King Tennis Center in New York. Some of the regionals are underway now, and others will be held next weekend, with the regional champions earning a place in the IIC draw. The eight quarterfinalists from the All-American Championships last weekend,as well as the consolation winner, have already qualified, and today the small college representatives were determined during the ITA's Super Bowl today in Fort Myers, Florida. The Division II, Division III, NAIA and Junior College regional champions play for national titles in their respective divisions over the first three days of the tournament, then the winners of those divisions play off for one of the coveted 32 spots in the Indoor draw. This year, NAIA Embry-Riddle's Deni Zmak won the men's overall title, defeating Tyler Community College's Mate Cutura 5-7, 7-6(4), 6-4. Zmak will be competing in both singles and doubles in New York, after winning the doubles title too, with Simon Felix. Zmak and Felix beat Division III champions Palmer Campbell and Brantner Jones of Middlebury 6-2, 6-3. The women's overall singles winner was Valentine Confalonieri of Division II Lynn University. Confalonieri beat Junior College champion Niriantsa Rosolomalala of Georgia Perimeter 6-7(6), 6-4, 6-2. The doubles team of Emma Onila and Linda Fritschken of Division II Barry claimed a 6-4, 6-1 win over Fausthy Pietersz and Joanna Savva of Tyler Junior College to earn their place in the Indoor Championships. For more on today's finals, see this article from the ITA staff in Fort Myers. Two unseeded left-handed Americans faced off for their first Pro Circuit singles title today, and it was 24-year-old Jeff Dadamo who emerged the winner against 21-year-old Evan King at the $15,000 Futures in Houston, Texas. Former Texas A&M All-American Dadamo, the 2011 NCAA doubles champion with Austin Krajicek, beat recent University of Michigan graduate King 6-3, 6-1 in the final. Former University of Virginia star Sanam Singh won the doubles title with Vijayant Malik, also of India, with the unseeded pair beating No. 4 seeds King and former Oklahoma standout Costin Paval of Romania 7-6(5), 6-4. In the women's $25,000 Pro Circuit event in Macon, Ga., No. 4 seed Anna Tatishvili of Georgia defeated top seed Ajla Tomljanovic of Croatia 6-2, 1-6, 7-5 in the final. The doubles title went to former Ole Miss players Kristi Boxx and Abby Guthrie, who defeated another unseeded team, Emily Harman (Syracuse) and Liz Lumpkin (UCLA), 3-6, 7-6, 10-4. At the $100,000 Tiburon Challenger, the doubles title went to former Tennessee All-American Rhyne Williams and Krajicek, the No. 3 seeds, who defeated Rajeev Ram (Illinois) and Bradley Klahn (Stanford), the No. 2 seeds, 6-1, 6-4 in final. The Tiburon championship is Krajicek's third Challenger doubles title of the year, the other two coming with another former Tennessee star, Tennys Sandgren. Today's win was Williams' first doubles title at a Challenger this year. The singles final didn't feature any Americans, with Peter Polansky of Canada defeating Matthew Ebden of Australia 7-5, 6-3, after Ebden beat top seed Denis Kudla and Polansky took out No. 2 seed Tim Smyczek in the semifinals. Tornado Alicia Black won her first pro tournament just two weeks ago, while Francis Tiafoe was more than 18 months removed from his last significant championship. There was no such contrast in the finals of the ITF Grade B1 Pan American Closed however, as both claimed titles with emphatic victories at the Michael D. Case Tennis Center on the campus of the University of Tulsa. Top seed Black defeated No. 13 seed Kaitlyn McCarthy 6-0, 6-0, but No. 3 seed Tiafoe's 6-3, 6-0 win over unseeded Taylor Fritz was actually over more quickly, with Tiafoe needing only 48 minutes to secure the win. The first four games of the boys final went to the server, but Fritz was broken in the fifth game, and he managed only one more hold of serve after that. Although Fritz had displayed an effective serve all week, Tiafoe's serve was the better of the two on Saturday. "This is the best I've served all week," said Tiafoe, who didn't face a break point in the match. "I was serving very well and moved him around, didn't let him camp too much, because his forehand is crazy good. I was trying to go 1 and 1 or 2 and 1 and move my forehand down the line or inside out, then backhands down the line to get him off balance, and it was working pretty well. He wasn't really liking it." After beating the No. 2 seed Spencer Papa and the No. 4 seed Danny Kerznerman on consecutive days, and coming straight from Wichita Falls, where he had won the Grade 4 title, Fritz could obviously cite fatigue for his lackluster performance. But he brushed off that suggestion. "I think it was pretty obvious that I wasn't playing anywhere near how I usually do, or how I have been this tournament," said Fritz. "I knew I had to play just like yesterday and the day before that if I wanted to win this match and I just played nowhere near my expectations. Sometimes you have those days." Fritz, who will be 16 later this month, said he thought Tiafoe played well, but continued to express disappointment with his own level. "The points I did make him work for, he still came up with the good shots," Fritz said. "Like match point, I thought I played fine. But I would have liked to have played not horrible to see if I could have done a little better." Tiafoe showed off his creativity several times, once hitting a perfectly sliced forehand overhead winner, as well as a powerful serve and forehand. On match point, he executed a backhand volley with such backspin it bounced on Fritz's side of the net, then lurched back into it. "It was one of the better match points I've ever had," said Tiafoe, a 15-year-old from College Park, Md. "He went at my feet, and I was like, let's see if this goes over, and it went in." 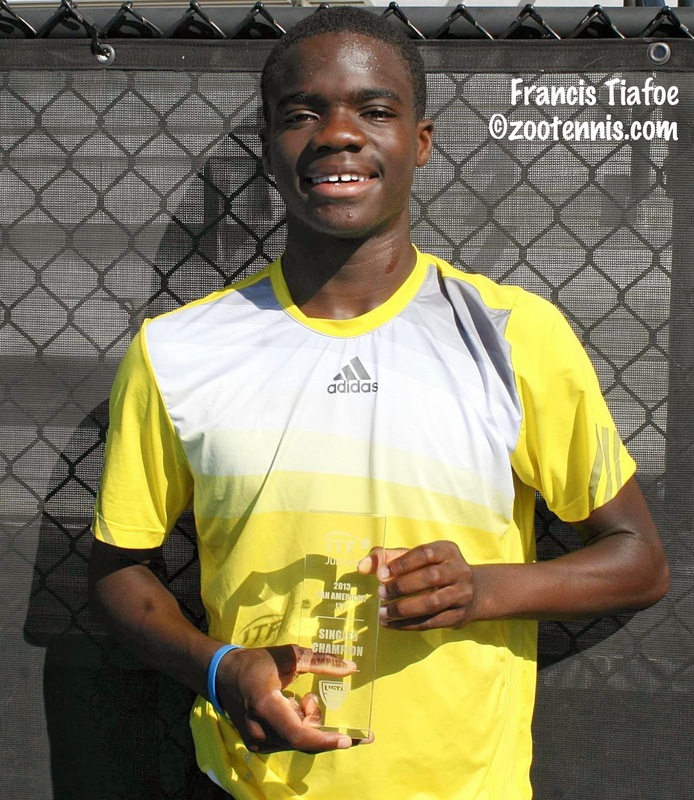 Since winning the international 14s tournaments Teen Tennis and Les Petits As in February of 2012, Tiafoe has claimed only one other tournament title, a USTA regional level in the 18s this summer. "It's not like I've been having bad tournaments, I've been going semis and quarters, most of them ITFs, so it's been tough," said Tiafoe. "But it's good now I've finally got a tournament under my belt. It's hopefully a confidence booster, so yeah, winning this tournament means a lot to me." With that confidence boost, Tiafoe is looking to play some Futures tournaments this fall in the US before returning to the junior ranks for the Eddie Herr and Orange Bowl. In the girls final, Black was at the top of her game, much more comfortable and aggressive than she had been in her three-hour, three-set semifinal win over Renata Zarazua. McCarthy had two break points in the second game of the match, but was unable to convert either one, and Black never looked back. Striking every ball with authority and seizing the opportunities McCarthy gave her, she didn't lose her focus as she collected game after game. "I had watched her a few games the other day," said Black, who wasn't familiar with McCarthy's game, or even her name, before the US Open juniors this year. "I went out there trying to hit angles. She left the court open for me to go down the line a lot, so I took advantage of that. I played really aggressive today." "She did pretty much what I expected," said the 15-year-old McCarthy, a Cary, North Carolina resident. "She defended really well, she played pretty aggressively, she kept most of the balls in the court. I just wasn't ready to play today, unfortunately. You have those days sometimes, every athlete does. It just wasn't really coming off the racquet right today. She played really well on top of that so it made for a very quick match." In an hour and three minutes, Black had her first ITF Grade 1 title, which she believes puts her into the Top 10 in the rankings. "It took me my third Tulsa to win," said Black, from Boca Raton, Florida. "I think I'm Top 10 in juniors, so I'm really excited about that. I don't look at the points and rankings, but my mom, I guess she does. She told me on the phone, oh if you win, you're Top 10, and I'm like, oh, no pressure, thanks. I prefer not knowing, but sometimes she opens her mouth on the phone." Like Tiafoe, Black is planning to play professional events this fall, but because she is only 15, Black is subject to the WTA age rules, which restrict her to only 10 ITF Women's Circuit or WTA tournament appearances this year, although as a junior slam finalist, Black gets an extra one, for a total of 11. So she is planning to continue playing junior competition, including the Eddie Herr and Orange Bowl this year. "I can't play all pro," said Black. "I'll play the junior slams, just focus on some of the big junior tournaments, and some more pro events, but I'm not sure about any of the other tournaments." Black fell short of sweeping the titles in Tulsa when she and partner Mia Horvit, the No. 4 seeds, fell to unseeded Gabby Andrews and Dasha Ivanova 7-6(6), 7-6(4) in the final Saturday afternoon. Of the 12 games in the first set, eight went to the deciding point in the no-ad format. Andrews and Ivanova both served for the first set, at 5-4 and 6-5, but didn't secure it until Andrews poached and putaway the volley on her team's third set point. In the second set, it was Black and Horvit who twice served for the set, again at 5-4 and at 6-5, but neither could get a set point on serve. The pattern ended in the second set tiebreaker, when Andrews and Ivanova ran out to a 5-0 lead and held on, with Ivanova blistering a forehand return winner off a Black second serve to secure the title. Playing together for the first time, Andrews and Ivanova were happy with their improvement as they advanced during the week. "The first round match we were struggling a little bit, but we were still having fun," said Andrews, a two-time junior slam doubles champion. "We didn't let one another get too down--we got down, but we didn't get too down." "We're always pumping each other up," said Ivanova. "I think we make a great combo," said Andrews. "Yeah," added Ivanova, "I actually do." Ivanova and Black both train at L'Academie de Tenis in Florida, but were on opposite sides of the net today. "Since we practice everyday, we know each other's games pretty well by now," said Ivanova, who turned 17 on Friday. "It's all mental, you know. One's trying to beat the other, she just won the singles, probably wants to go for the doubles too. But you've just got to play fair and see what happens." 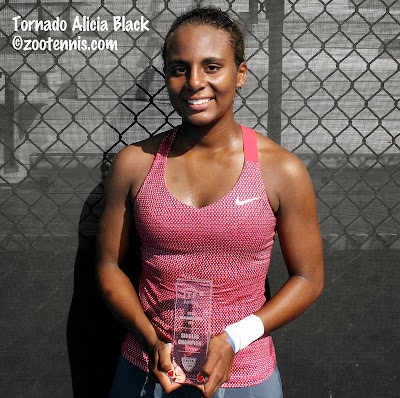 "I played her in doubles in Maryland (ITF Grade 1 International Hard Courts) and I won there," said Black. "She won here. We go on and off. We play each other a lot. But she played with Gabby and Gabby's won all the junior slams. She really knows how to play doubles, so I just went out there and did my best." At just under two hours, the girls doubles final was longer than both the singles finals combined. The boys doubles final between top seeds Tiafoe and Michael Mmoh and No. 2 seeds Papa and Kerznerman was not played. 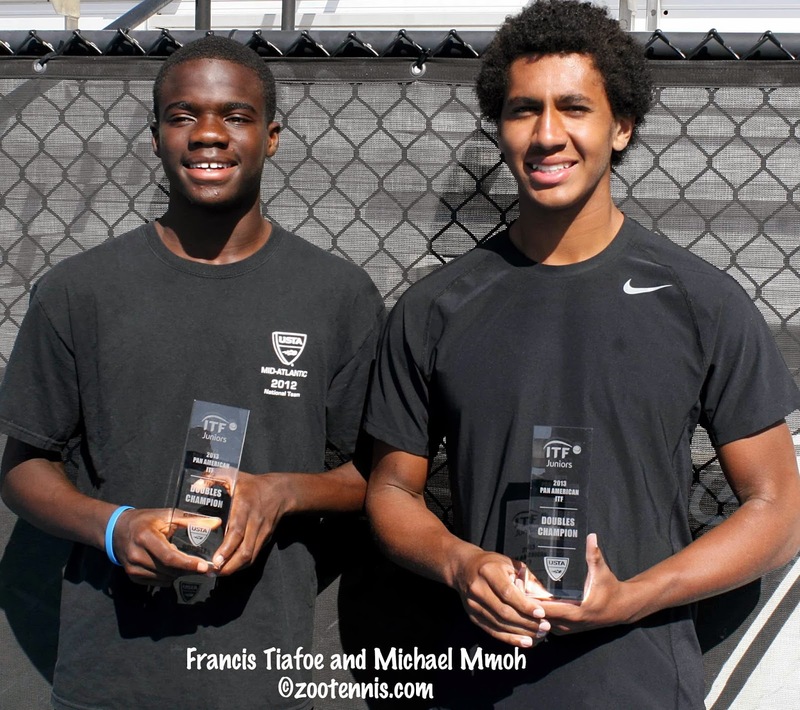 Due to a back injury, Papa was unable to compete in the final, so Tiafoe and Mmoh won the title via a walkover. For complete results, see the USTA ITF tournament home page.